for $1,950,000 with 5 bedrooms and 3 full baths, 1 half bath. 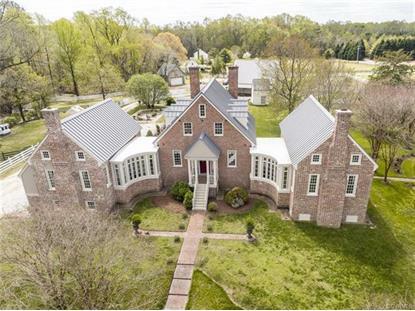 This 5,653 square foot home was built in 1809 on a lot size of 22.6200 Acre(s). This 5 bedroom, 3.5 bath, 2 kitchen, 22.6 acre property has it all. Fine dining, shops, and local winery/brewery all just 10 minutes away, with easy access to major hospital and Norfolk as well. With the historic circa 1809 Davis-Day house (renovated 1990) at its center, there are two wing additions (2014) which offer space & sophisticated modern touches. A stunning chef's kitchen features a generously-sized island with marble counter tops--entertaining options galore! Soaring ceilings in the family room complement the brick-faced, wood burning fireplace. Classic foyer, dining & living rooms maintain the historic charm of the original house. The 1st floor master boasts cathedral-style pine ceilings & gorgeous property views. The master bath, with double vanity, fireplace and clawfoot bathtub complete your private oasis. There are three additional bedrooms and one full bath. The walkout basement is reminiscent of an old English tavern and offers endless possibilities. Outside there are beautiful porches, ample grounds, pond, barn, paddocks, and riding ring for the equestrian. The property provides the perfect pastoral fusion of history and modernity without sacrificing convenience!